1887 Hopkins Real Estate Map. DC Public Library, Special Collections. THE NAME OF ANACOSTIA. given to old Uniontown four years ago, is used in such a vague manner and so often confused with its surrounding suburbs, which have names of their own and are entirely distinct from it, that a few words of explanation seem required. 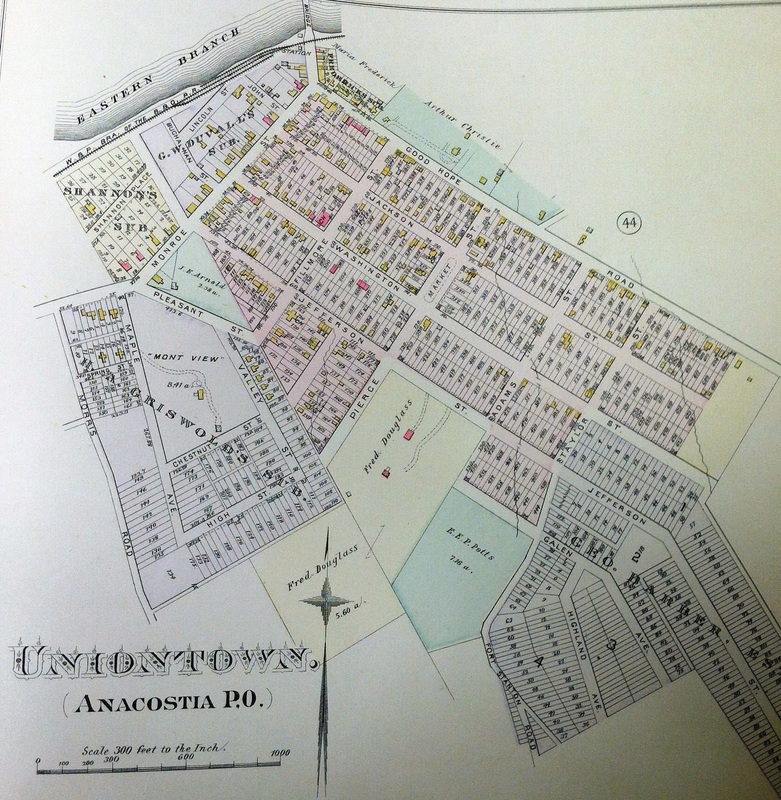 Anacostia by the police census taken last summer had a population of 1,529 white people and 160 colored. The latter are mostly domestics, there being but one colored family besides that of the distinguished Mr. Frederick Douglass, in the place. The population is composed very largely of government employees and their dependents. Hillsdale, a half mile beyond, is almost exclusively a colored settlement, there being by the same census 1,612 colored and 57 white residents. Garfield and Good Hope, two little settlements a mile and a half southeast, had together 240 colored and 19 white inhabitants. They have have their own post-office, though Hillsdale is served from Anacostia. Hiram Pitts, white, a resident of Anacostia, aged eighty-five, employed in the Fifth Auditor’s office, works regularly and often walks over to the Navy-Yard cars. Hannah Bruce, colored, of Hillsdale, is now 101, she having a record of her birth. John Baddy, colored, is 97. Rolley Pursell, white, is 85 and his wife 82, and there are several other octogenarians, besides one case of a colored woman, being the mother of over a score of children, and still retaining her health and gladness at heart. “ANACOSTIA,” Evening Star, May 16, 1889, p. 3. This entry was posted on June 10, 2014, 1:57 pm and is filed under Uncategorized. You can follow any responses to this entry through RSS 2.0. You can leave a response, or trackback from your own site.